Air Force Materiel Command (AFMC) is a major command of the United States Air Force (USAF). AFMC was created July 1, 1992 through the amalgamation of Air Force Logistics Command and Air Force Systems Command. AFMC is headquartered at Wright-Patterson Air Force Base, Ohio. Its commander is General Janet C. Wolfenbarger. Lieutenant General Andrew E. Busch is the vice-commander. Chief Master Sergeant Michael J. Warner is the Command Chief. It is one of ten Air Force Major Commands. AFMC has a workforce of about 78,000 military and civilian personnel. It is the Air Force’s largest command in terms of funding and second in terms of personnel. AFMC’s operating budget represents 57 percent of the Air Force budget, and AFMC employs more than 40 percent of the Air Force’s total civilian workforce. The command conducts research, development, testing and evaluation, and provides the acquisition management services and logistics support necessary to keep Air Force weapon systems ready for war. The command develops, acquires and sustains the aerospace power needed to defend the United States and its interests for today and tomorrow. This is accomplished through management, research, acquisition, development, testing and maintenance of existing and future weapons systems and their components. The Airplane Engineering Department was established by the Equipment Division, U.S. Signal Corps in 1917 for World War I experimental engineering. The department had a 1917 Foreign Data Section, and the Airplane Engineering Department was on McCook Field at Dayton, Ohio (the 1917 Patterson Field and Fairfield Aviation General Supply Depot were nearby.) McCook Field established the Air School of Application in 1919 and after WWI, the department was renamed the Airplane Engineering Division on 31 August 1918 under Lt Col Jesse G. Vincent (Packard co-engineer of the 1917 V-12 Liberty engine) to study and design American versions of foreign aircraft., and the division merged in 1926 with the Air Service's Supply Division (formed by 1919) to form the Material Division (Air Corps). In 1920, the Engineering Division's Bureau of Aircraft Production completed the design of the Ground Attack, Experimental, (GAX) aircraft built as the Boeing GA-1, and designed the VCP-1 that won the initial Pulitzer Race in 1920 at Roosevelt Field (the division also designed the TP-1 and TW-1. The Material Division was set up for four functions: research and development, procurement, supply, and maintenance—on October 15, 1926, under the Office of the Chief of the Air Corps (OCAC) and had characteristics of a major command. McCook Field was demolished April 1, 1927, after its assets moved to the new Wilbur Wright Field that served as the Air Corps' 1927-47 R&D center (including the Physiological Research Laboratory opened in 1935). By August 22, 1935, the division operated[where?] an Army Aeronautical Museum, and by November 22, 1935, had an "Industrial War Plans Section". F.B. Vose became the Material Division commander on October 19, 1940. Procurement inspectors at Wright Field were employed in 1940 by the division, which had 4 Field Service Sections: San Antonio, Fairfield, Middletown, and Sacramento. Air Technical Service Command (ATSC) was designated when AAF Technical Service Command was renamed on July 1, 1944, and its two component acquisition commands—Material Command & Air Service Command—were abolished on August 31, 1944. By 1945, 14 CONUS bases had ATSC facilities: Newark, Fairfield, Miami, Middletown, Mobile, Ogden, Oklahoma City, Oakland, Rome, Sacrament, San Antonio, San Bernardino, Spokane, & Warner Roings (e.g., Chico AAF transferred to ATSC on 15 October 1944). In 1945 planning began for a separate USAF, and in January 1946 "Generals Eisenhower and Spaatz agreed on an Air Force organization [composed of] the Strategic Air Command, the Air Defense Command, the Tactical Air Command, the Air Transport Command and the supporting Air Technical Service Command, Air Training Command, the Air University, and the Air Force Center." (For the latter, the Army Air Forces Center instead merged with the Army Air Forces Proving Ground Command on 8 March 1946 to form the Air Proving Ground Command.) ATSC enters were renamed, e.g., the Kelly Logistics Depot's "San Antonio Air Technical Services Command" became the San Antonio Air Materiel Area in 1946. Air Material Command was established on March 9, 1946, and in November 1946, AMC's History Office published Material Research and Development in the Army Air Arm, 1914-1945. AMC bases ransferred to the 1947 United States Air Force, e.g., the storage depot in Maywood, California became Cheli Air Force Station. Research and Development Command established on 23 January 1950 gained the R&D mission from Air Material Command, which retained procurement, supply, and maintenance. R&D Command was redesignated Air Research and Development Command on 16 September 1950, and the Arnold Engineering Development Center was dedicated by President Harry S. Truman on June 25, 1951. AIMACO, the "Supply Control Command compiler" for Air Materiel Command, began c. 1959 with the definition of a high level programming language influenced by the Flow-Matic and COMTRAN programming languages. The draft AIMACO language definition was developed by an AMC-chaired committee of industry representatives from IBM, United States Steel, and AMC Programming Services. AIMACO had two compilers specified/designed (never produced), and AMC originally intentded all programming for AMC systems would be in AIMACO and compiled on a UNIVAC at the WPAFB AMC headquarters for operation on UNIVAC or IBM computers. An alternative compiler was designed by AMC Programming Services to compile systems on IBM computers for operation on IBM computers. AIMACO, along with FLOW-MATIC and COMTRAN, influenced development of the COBOL programming language. 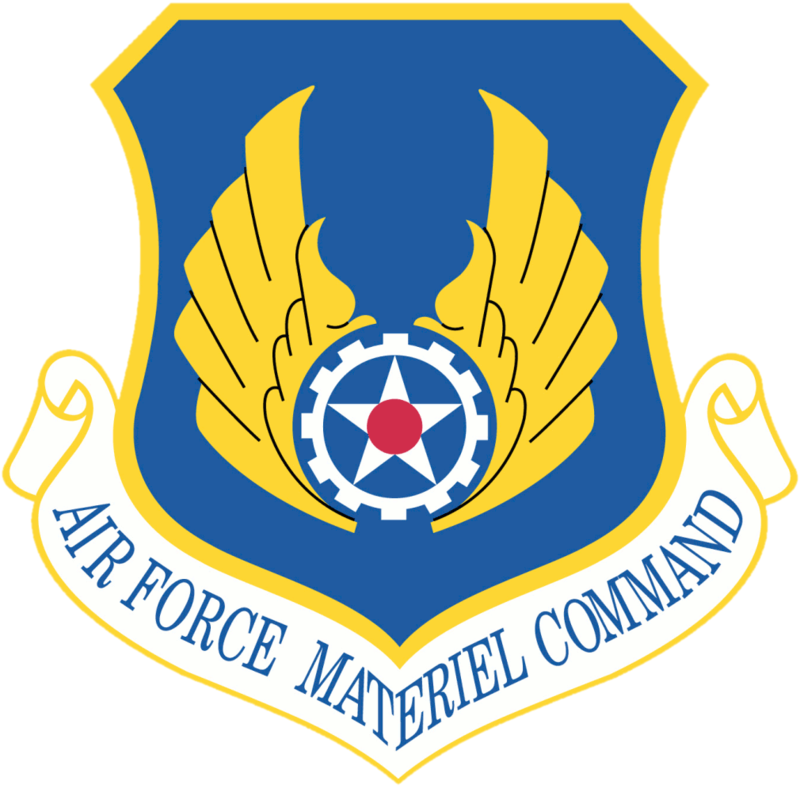 Air Force Materiel Command (AFMC) was activated on July 1, 1992, from AFLC & AFSC when the four missions were merged as for the 1944 USAAF Air Technical Services Command. AFMC fulfills its mission of equipping the Air Force with the best weapon systems through the Air Force Research Lab and eight specialized centers responsible for the "cradle-to-grave" oversight for aircraft, electronic systems, missiles and munitions. For instance, weapon systems, such as aircraft and missiles, are developed and acquired through three product centers, using science and technology from the laboratory research sites. The systems are then tested at AFMC's two test centers. Over the system's lifetime, it may be serviced, upgraded or repaired at the three air logistics centers. The command's specialized units perform many other development and logistics functions, including scientific research and the retirement or sale of older systems. In addition, the command operates associate units on several non-AFMC bases. In 2012, there was a major reorganization and several new Centers were organized. Among them, the Air Force Sustainment Center at Tinker now directs the Oklahoma City, Ogden, and Warner Robins Air Logistics Complexes. ↑ "General Janet C. Wolfenbarger". Archived from the original on 2012-07-22. http://archive.is/evYw. ↑ "Lieutenant Andrew E. Busch". Archived from the original on 2012-12-12. http://archive.is/OK3e. ↑ 4.0 4.1 "Records of the Army Air Forces [AAF"] (weblist). NARA. http://www.archives.gov/research/guide-fed-records/groups/018.html. Retrieved 2013-08-19. ↑ Ashcroft, Bruce. "Part 4" (mirror page "FTD, then and now"). A Brief History of Air Force Scientific and Technical Intelligence. https://groups.google.com/forum/?fromgroups#!topic/alt.politics.org.cia/zDDUjrpD1Nw. Retrieved 2013-02-13. ↑ (AFD-120627-049) ﻿National Air and Space Intelligence Center History﻿ (Report). Archived from the original on 2013-02-12. https://docs.google.com/viewer?a=v&q=cache:2quf0p5Oi8AJ:www.afisr.af.mil/shared/media/document/AFD-120627-049.pdf+%22Building+856%22+%22national+air+and+space+intelligence+center%22&hl=en&gl=us&pid=bl&srcid=ADGEESgXx83xmqJIiQtQsL5fr4NQKKlu8rfoKTmeAu_UuvVNhzZdEl2ubNGGyR8EH0ASBq4GNUhNNDq0qneWMRGcuFUy9ZmFgxPtjX0ZgpquoQ4prSX-d6-X_vPC3Ir-3aicn5QI2PBT&sig=AHIEtbTx84__4s_nK1RZnIOXwjL4DixVUQ. ↑ Leonard, Barry (2009). History of Strategic Air and Ballistic Missile Defense. Vol II, 1955-1972. Fort McNair: Center for Military History. p. 47. ISBN 978-1-4379-2131-1. http://www.history.army.mil/html/books/bmd/BMDV2.pdf. "In November 1945, General Dwight D. Eisenhower became Army Chief of Staff, while General Carl Spaatz began to assume the duties of Commanding General, Army Air Forces, in anticipation of General Arnold’s announced retirement. One of General Eisenhower’s first actions was to appoint a board of officers, headed by Lieutenant General W. H. Simpson, to prepare a definitive plan for the reorganization of the Army and the Air Force that could be effected without enabling legislation and would provide for the separation of the Air Force from the Army." ↑ San Antonio Air Logistics Center Office of History, Kelly AFB, Texas. A Brief History of Kelly Air Force Base. San Antonio, June 1993. ↑ "Air Force Systems Command". AFHRA.AF.mil. 1/10/2008. http://www.afhra.af.mil/factsheets/factsheet.asp?id=10956. Retrieved 2013-08-17.